Somerset Yurts offers luxury glamping holidays nestled on a working Dairy Farm in the beautiful Quantock Hills. Come and enjoy the space, let the kids run free, and explore the beautiful countryside around us – our accommodation provides the perfect setting for you to relax, unwind and unplug. 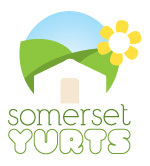 Somerset Yurts is set across three fields of about three acres enjoying far reaching views over Taunton Vale to the Blackdown Hills in the distance. Our yurts are furnished with everything you’d expect, including a regular power supply, comfy double bed, and a lovely crackling warm woodburner to keep you toasty in the evenings. Our safari lodges are larger, and have two separate bedrooms, along with their own kitchen and private bathroom. The communal barn provides a regular kitchen with home comforts if you don’t fancy BBQ’ing or cooking on the camping stoves provided with the yurts. The barn also houses wonderful hot power showers and proper flushing toilets…this is luxury camping after all. Picture yourself relaxing on your deck with the BBQ gently sizzling, the cows grazing in the distance and nothing but the sound of birds singing in the background. 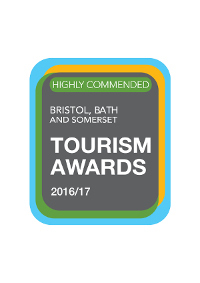 We’re easily accessible, only about 15 minutes from J25 of the M5 (about a two and a half hour drive from London for example), with trains into Taunton from Exeter and London Paddington. Book your yurt holiday with us, switch off, and get back to nature, enjoying a tranquil break from the hustle and bustle of everyday life. 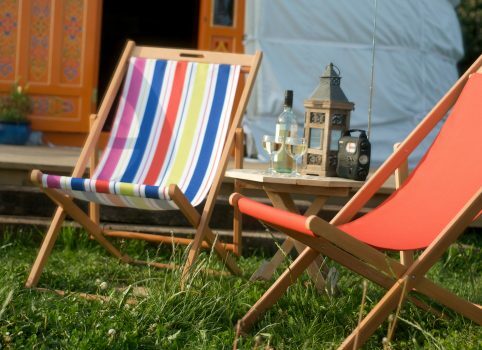 Whether you’re a family, or couple, looking for a yurt glamping holiday, or a group wanting a small, exclusive site you can book all to yourselves – get in touch.